Tweed is a classic fabric that exudes class and refinement. Coco Chanel comes to mind when I see tweed. The knobby material intricately woven in jackets, skirts, and shorts matched with pearls is the definition of a classy outfit. Tweed is a rough, unfinished woollen fabric of a soft, open, flexible texture. It is made in either plain or twill weave and may have a check or herringbone pattern. The multi color effects are obtained by twisting together differently coloured woollen strands into a two- or three-ply yarn. I wear my tweed jackets with denim and skirts and love a tweed short with tights and a blouse. I often toss on a strand of pearls to perfectly compliment the look or edge it up a bit with an ear jacket and stacked bracelets. Which ever combination you choose, a tweed item is sure to fancify any outfit you choose. Tie Dyed clothes have been around forever. Remember making them with your mom with buckets filled with colored dye, rubber bands and white clothing? The messy, easy way to get creative with clothing is cycling around again. Living in Southern California, I also think of hippies and the Venice Boardwalk when I think of tie dye. But tie dye can be pretty and lovely if done correctly. Several brands do this well and my favorites are listed below. Planet Blue’s in house brand, Blue Life has great options. Gypsy 05 has easy breezy dresses and Raquel Allegra makes the best gauzy tees and dresses. Leave the dye alone and purchase your items from the sites below. Paige denim released their new metallic jeans campaign and I am in need of the bright blue pair. The flash of metallic is just the rocker touch that my basic black tanks and tees need for a night out on the town. I love the sheen of the fabric and the rips in this particular pair. Colored denim is always a good choice, but metallic colored denim is beyond. You must pair this look with basics as to not look like you are trying too hard or dressed for a throw back costume party. The look should be relaxed and dressy all at the same time. The shiny glow radiating off your jeans as you dance the night away will only add to your appeal and fun factor. I will be adding this glistening pair of denim into my wardrobe soon. I have been obsessed with stone fruits lately. 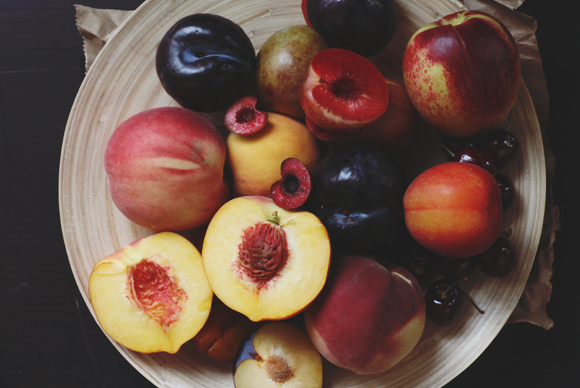 The fruits that are part of the stone fruit family are peaches, nectarines, plums, apricots, and cherries. They commonly are referred to as “stone fruits” because the seed is very large and hard. Stone fruits have many benefits. They contain Vitamin C which helps the body form collagen—the main protein in connective tissue—in bones, cartilage, muscle and blood vessels. It also helps to increase iron absorption. They have lots of potassium, which is key for proper nerve and muscle function. They help to strenghten your bones due to the vitamin K they contain. All stone fruits contain lots of fiber in their skin to help keep you regular and fight bloat. I really enjoy the sweetness of the fruit and often cut them up and have them for breakfast or a snack. I also use them as toppings on yogurt, cottage cheese, cereal, and on pancakes. They are also a good on-the-go snack as they just need to be rinsed and are ready to eat. The colors of these fruits are so beautiful and are sure to brighten your day! I came across the images from Carolina Herrara’s S/S 2015 NYFW show and was inspired by the hairstyle I saw. Famed hairstylist, Orlando Pita created a Japanese “Sumo Knot” for the models for the show. The result was this sleek, beautifully crafted top knot, with half the ponytail left out and flatted and sprayed in place. It was like a work of art on top of each model’s head. I am in love with it and can’t wait to have one of my hairstylists recreate it on me. The look was sponsored by CHI/BioSilk and the breakdown of how to get the look is below. 1. Apply a generous amount of BioSilk Firm Hold Hairspray to a brush and the hair and use it to sculpt the hair into a sleek ponytail with a large CHI Turbo Nylon Brush that is placed 2 inches below the crown area. Secure the ponytail with a band. 2. Run the CHI G2 Ceramic & Titanium Digital Hairstyling Iron through the length of the ponytail so it is sleek and smooth. 3. Spray a generous amount of BioSilk Firm Hold Hairspray onto the length of the ponytail and while damp take a tail comb and the CHI G2 Ceramic & Titanium Digital Hairstyling Iron to gently fold the ponytail in half to form an off-center looped bun shape while bringing the remaining hair down the center to form a tail and secure with an elastic band. 4. To create the ultra-sleek tail and add length to it, use an extension sprayed with BioSilk Firm Hold Hairspray and straightened with the CHI G2 Ceramic & Titanium Digital Hairstyling Iron. Cut the ends on a sharp angle and attach under the loop blending it over the existing tail and secure with pins. 5. Take a separate piece of extension about 2-3” in width spray it with BioSilk Firm Hold Hairspray and straighten with the CHI G2 Ceramic & Titanium Digital Hairstyling Iron to form a ribbon-like piece. Wrap around the elastic band to hide it. 6. Apply BioSilk Shine On Spray to complete the look. One of my favorite healthy breakfasts to make only takes two ingredients. Two eggs and a ripe banana. These make up thin, crepe like pancakes that are light and delicious. Peel one ripe banana and put into a bowl. Blend well with a hand mixer to create a fluffy banana base. Crack two eggs into the banana puree and whip until frothy. Take a 1/4 measuring cup and measure out this amount of batter and pour onto a greased, preheated pan. The pan must be heated just below medium heat because these pancakes cook quickly and tend to burn fast. I use coconut oil spray to grease the pan. Use a metal spatula a flip the pancakes once the top is covered in bubbles and the bottom is a beautiful golden brown color. They will only need about 30 seconds to finish cooking on this side. Once they are all ready, put on a plate and you can top with fresh fruit, greek yogurt, agave or all three! Fall is fast approaching and knee high socks are the perfect transition piece to add into your wardrobe. These fuzzy finds will keep you cozy and warm as the leaves fall and the weather dips. I love how they add a school girl touch or bohemian vibe to any outfit and can be worn dressy or casual. There are so many versions with prints, colors, and various thickness. I love the look of a thicker sock and a sweater for lounging around at home or at the cabin. Curl up with a good book, fashion magazine, or movie and add hot cocoa with marshmallows for the perfect Saturday in. Pair a thiner sock with a skirt or dress and tuck them into a boot for a night out on the town. This look is one of my favs and I can’t wait to break them out of my dresser now that it is fall.